Your Own Private Deck on the Beach! It would be hard to find a better property on the boardwalk in San Diego's Mission Beach. Although the view is worth the price alone, we have done our best to make sure you will enjoy your stay and be comfortable indoors as well as out. This 2 bedroom, 1 bath unit is furnished with relaxation and simplicity in mind. Quality and comfort are yours in every room. The large, private deck has patio furniture, a gas grill, and of course, the unforgettable view! The master bedroom has a queen bed and the 2nd bedroom has a bunk bed with a twin top and a full-size bottom. Parking is available on site in a private, one-car garage. It's all here, come and enjoy it! 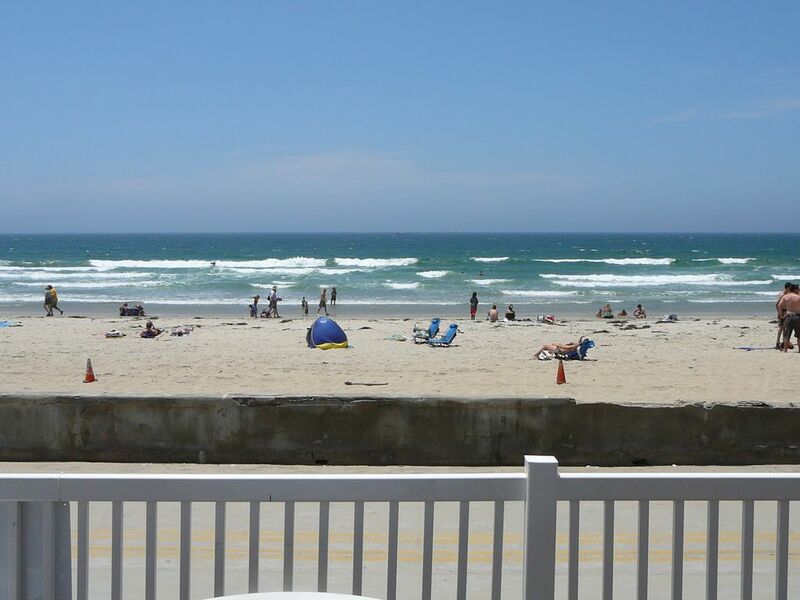 Mission Beach is one of San Diego’s most popular beach destinations. It is here where you can enjoy what everyone comes to the beach to enjoy. Do you enjoy miles of boardwalk and beaches? Parks and picnics? Bars and restaurants? Roller coasters, roller skates, and bicycles? Shopping and sightseeing? Rest and relaxation? Crashing waves and serene bays? A cool breeze and palm trees? Whatever it is you want to enjoy on your vacation, you will find it just steps away from this oceanfront property. This property is on the beach facing the beach. This property is on the ocean facing the ocean. Including bath towels and beach towels. Very basic cable, no premium channels. There is a shelf-full of take-one/leave-one books available. Exclusive to our unit only. Can only be accessed from within the unit; no boardwalk/beach access from deck. Wonderful location. Right on Mission Beach. great location and responsive owner. Location is great! The deck by the boardwalk is fabulous. Peter was very responsive. Location was great. Condo Met our needs but if you are looking for a lot of room and fancy this would not be for you. We loved the location of this home. Plenty of shopping, eating, rentals, the beach, and even an amusement park - just steps away! Convenient access to the highways, the zoo, Sea World, and more. The house was clean and as represented. Even the BBQ worked well! Staying over New Years, we were concerned about the potential for noise. HOWEVER, the boardwalk and Peter's units were nice and quiet. The community was quite respectful. Our only disappointments were nature related, with below average temperatures across the Southwest during our stay, so we didn't get to use the beach as much as we were hoping. This was just the luck of the draw with our particular travel dates though and, even so, we were still able to find lots of seashells and sand dollars along the beach, and view many gulls, pelicans, porpoises, and even a seal right from our porch. We would definitely stay here again!!! We had a great experience with this condo. We spent our Christmas here with our teenage children. It has a beautiful large deck that was great for people watching on the boardwalk. It was very close to Belmont park and restaurants. The property was clean and well maintained. We loved the garage for our rental. Everything was easy and convenient. Thank you for a wonderful family memory. San Diego is full of pleasant surprises for visitors and locals alike. There are 70 miles of beaches, numerous cliffs and tidal pools, and nearly every water activity available under the sun. Major attractions such as Sea World, Legoland, and the world famous San Diego Zoo and Wild Animal Park offer a day's worth of fun each by themselves. Museums seem to be around every corner. Historical monuments and points of interest abound. Restaurants and nightclubs offer every choice from the most casual to the most elegant. There are shops for every kind of shopper: indoor and outdoor malls, street vendors, sidewalk shops, strip malls, cultural shopping centers and markets, and then some. Mountains and deserts are nearby and Mexico is just down the street, almost. Yes, there is something here for everyone! For those who want it all or for those who want to get away from it all, San Diego is the place to be!